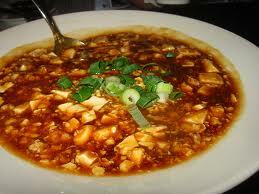 Staying with our Asian theme, here is a favorite dish of mine. I wanted to find a way to make it without the ground pork, so it would have all of the flavor I love, but without the heaviness and greasiness of the pork. It has a few critical ingredients, which might take a bit of time to find, but once you have them you will have enough to make this dish many times. I have divided it into four steps to make it easier to follow. Give the recipe a quick read, so you know what ingredients to have prepared prior to starting cooking. Combine these ingredients into a small mixing bowl and mix thoroughly, and set aside. Preheat your wok until hot and then add 3 Tbsp of oil and stir fry the garlic, ginger, mushrooms and green onions until just slightly softened. 6 Tbsp fresh Shitake Mushrooms finely chopped. 6 Green Onions, chopped, white part only. Set the green bits aside for dressing the dish at the end. Add in the black beans, peppercorns and chili bean paste and sauté briefly. 1 Tbsp Fermented Black Beans, mashed. 1 tsp Szechuan Peppercorns, ground. These are critical, so keep looking until you find them. Add the tofu and gently toss for 1 -2 minutes. Then add the vegetable broth mixture and gently toss until the dish thickens. Sprinkle the reserved green onions on top as garnish and serve with white of brown rice.